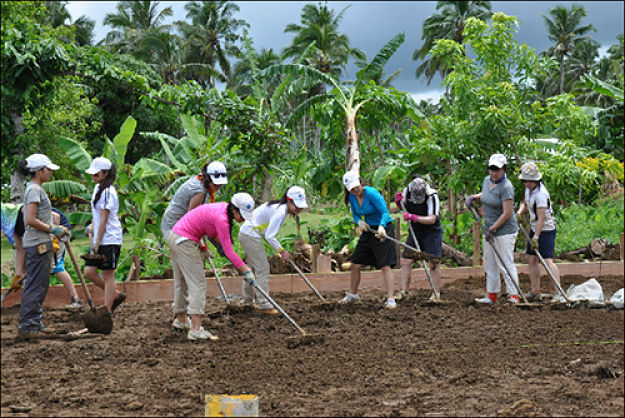 Volunteer travel is something near and dear to our hearts. Recently, we helped some students from Richmond Secondary in BC travel and volunteer in Samoa as part of the school’s Global Perspectives program. This program aims to open young Canadians’ eyes to diverse cultures and give them a ‘global perspective’. The exposure to various cultures gives them the ability to deal constructively with differences, so that they are well-equipped to tackle global issues like poverty in the future. This year, the students chose to travel to Samoa and build a multi-purpose playing area in the Saleapaga village. Why Samoa? Samoa has faced serious challenges over the last two or three years. A major cyclone last December destroyed large areas of the main city of Apia. In September 2009, the southern coast was hit with a massive 8.3-magnitude earthquake. Within 10 minutes of the quake, three large tsunami waves destroyed much of the southern coast on the island of Upolu. The village of Saleapaga, where the students chose to volunteer, was the hardest hit. Thirty two people, including a number of young children that were walking to school, died as a result. With the help of the Red Cross and the United Nations in New York, Global Perspectives was united with the people of Saleapaga. Their entire village was relocated to higher ground, hence the need for new community infrastructures like the playground. This project was truly a community event, which saw as many as 50 young Samoan men show up throughout the week to help in the building efforts. We’re so proud to support the Global Perspectives program, and hope to do so for years to come.